Russian Prime Minister Dmitry Medvedev with the Indian delegation at INNOPROM. Instead of following Beijing’s big business and government-backed large project model with Russia, New Delhi should focus on SMEs, and support tie-ups between the Indian and Russian startups. Bilateral trade between Russia and its international partner at INNOPROM-2015 industrial trade fair, China stood at $64.2 billion in 2015. Although this was a massive 28 percent fall from 2014, the Sino-Russian trade figures completely dwarf the $10 billion in bilateral trade between Russia and India. However, the China-Russia numbers can be deceptive. At a conference organized by the Russian International Affairs Council (RIAC) in June, Chinese businessmen complained about the fact that the trade numbers were boosted largely by projects that had the personal interest and direct backing of Vladimir Putin and Xi Jinping. The common complaint was that trade at the level of small and medium sized enterprises (SMEs) was paltry and that there was still a great deal of mistrust for China in Russian business circles. In other words, it was only the large companies, and not the economy as a whole, that benefitted from Sino-Russian trade. 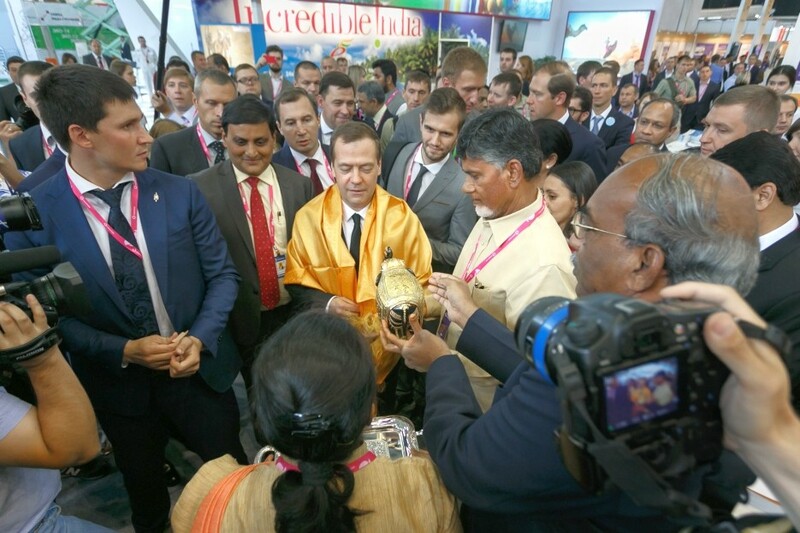 This year at the INNOPROM, India is the partner country and many of the business-minded political heavyweights from the country have turned up to Yekaterinburg. The delegation, headed by Minister of State for Trade and Industry Nirmala Sitharaman, has Maharashtra Chief Minister Devendra Fadnavis and Andhra Pradesh Chief Minister Chandrababu Naidu. Several MoUs have been signed between Russian and Indian enterprises, with the former expressing an enthusiasm to be a part of Narendra Modi’s ‘Make in India’ initiative. There’s also a lot of talk about increased cooperation between Russian regions and Indian states. While this is a welcome initiative that has managed to bring about tangible results for the business community in Astrakhan and Gujarat, Russia and India are still not getting it quite right with the basics. For starters, the countries are gifting away millions of dollars to the big three Gulf airlines (Emirates, Etihad and Qatar Airways) by having no direct air connectivity between Moscow and cities like Mumbai, Bangalore and Hyderabad. Air India and Aeroflot (which has 2 daily flights to Delhi) seem to have no intention of starting a direct Moscow-Mumbai service. Going by what overworked visa officers in Russian diplomatic missions say, there is an unprecedented number of Indian business visitors and tourists applying for Russian visas. Yet people from bigger Indian cities are helping the bottom line of foreign air carriers. Looking at the MoUs and agreements at INNOPROM, it seems like Russia wants to have a similar business model with India as it does with China. As stated by many Chinese businessmen and analysts at the RIAC conference in June, such an approach does not help a larger number of Chinese and Russian people. India needs a different kind of business strategy when it comes to Russia. An area that holds tremendous potential in both Russia and India is the innovation sector. The startup scenes are lively in both countries. Moscow is embracing innovation and ecommerce at lightning speed. There is even an app, which offer delivery of vegetarian and vegan food in the Russian capital! Russia and India need to encourage and finally support cooperation and initiatives between startups in both countries. Let’s get the best brains from Bangalore and Skolkovo together to bring about the next big invention. The startup sector has the potential to be a major employment generator in both countries and could fuel a technology boom. A few barriers still remain. Despite easing of business visa procedures, it is still not very easy for small-scale Indian businessmen to get a Russian visa. In addition, rules regarding work permits should be simplified by both countries. India and Japan signed an agreement to that effect a few years ago. There’s no reason that bureaucrats in Moscow and New Delhi can’t work out something similar, given that there is both political will and backing. Russia and India should by all means encourage cooperation between state-owned entities like Rosneft and ONGC. There is the right approach at INNOPROM when it comes to bigger companies. However, the state-initiated approach has taken Sino-Russian trade only so far. It’s the private sector that is going to fuel the economies of Russia and India in the long run and if SMEs get the right amount of support and encouragement they could be the force that powers Indo-Russian trade to new levels. Indian Railway Minister Suresh Prabhu should take the Sapsan between Moscow and St. Petersburg and see how we can have a similar world-class high-speed train connecting big cities in India. It would cost a fraction of what the bullet trains costs, be profitable and give airlines a run for their money.